Whether you’re renovating or concerned about the environment, the 3400-DVTR20N is the ideal solution for your home. Built to the high traditional quality standards of Archgard, this 34" heater rated direct vent gas fireplace will fit any budget. Start with the standard unit and add on an optional variable speed fan, ceramic fibre brick panels, or your choice of three contemporary louvres that are easy to install. With a 20,000 BTU input, the 3400-DVTR20N is not only easy on heating bills; it’s easy on the environment with its high energy efficiency. 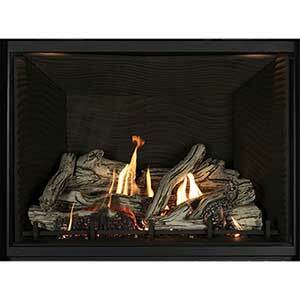 Installations are effortless with simple top or rear flex venting on a shallow 16" firebox. No tools are required to remove the ceramic glass, making cleaning a breeze. The only hard part about the 3400-DVTR20N is deciding how many rooms of your home to put it in. Archgard’s newest direct vent fireplace, the 41-DVTE36LN, is accompanied by the most versatile styling options of any Archgard fireplace. 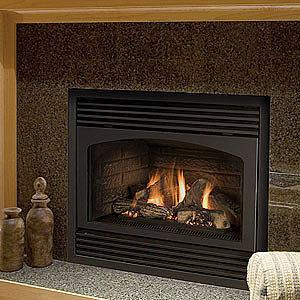 Finish your fireplace with the classic Quebec City Red panel set for that traditional old-world charm, or choose an alternative traditional look with the Quebec City Grey panel set modelled on brickwork found in La Citadelle de Quebec; add a rugged touch with the Appalachian Ledgestone Grey panel set reminiscent of the jagged hills within the Appalachian mountains, or get lost as the flames dance across the dark sandy waves of the Lost Coast Black panel set; or, watch the flames multiply with the Eternal Flame reflective ceramic glass panel set. 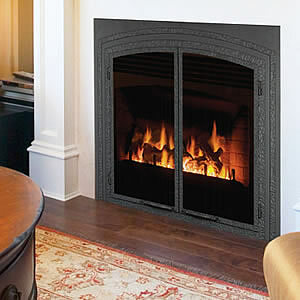 With Archgard gas fireplaces, our flame can be seen throughout the whole firebox. The combination of our innovative burner design and unique log sets allow us to give you the look and feel of a traditional wood fire, complete with glowing embers. Paired with any of our stylish decorative accessories, the 72-DVT30N is adaptable to your home‘s décor. Unlike the majority of products on the market, the Convective Fan and Brick Liners are standard in all Archgard heater rated fireplaces and will not cost you extra. You have the option to add decorative accessories to your fireplace from our range of designer fronts, louvres or overlays.